Premier sponsorship of one of our signature events and a customized set of benefits. A personalized hike or volunteer event for up to 20 of your staff or clients. A community partner spotlight in our quarterly e-newsletter. An article featuring your business in our e-newsltter. Thanks and acknowledgement in our e-newsletter. Partner-level recognition at one of our quarterly One Tam work day celebrations and reserved volunteer spots. Your logo on our business partnership page with a link to your business. A supply of Mt. Tam maps and buttons for your customers. Listing on our "Thank you " sign at our quarterly work day celebrations. Recognition in our business partnership page with a link to your business. Invitations to monthly hikes and special events. 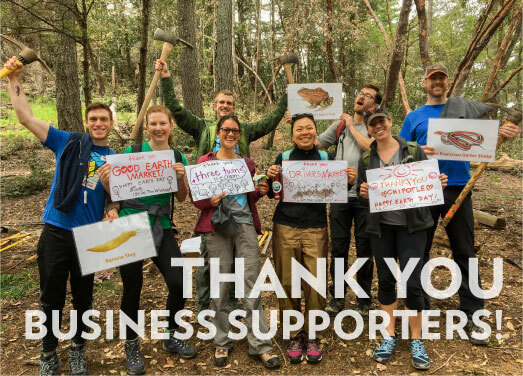 Join Us at the level you can support, and send a message that you care about conservation and about Marin!